The Dave Owens and Frank Goodall Memorial Fund Chatsworth Challenge Walk takes place around the beautiful countryside of the Chatsworth Estate in the peak district of Derbyshire. 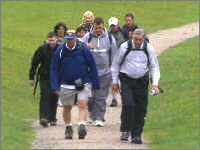 for this event the format is similar in that two walks are available, and participants can choose to do either of the distances. The main longer walk is generally a distance of around 22 miles and is for the strong willed and determined walkers who relish a tough test. The shorter second walk is around the 8 or 9 mile mark, and provides an event for those who feel comfortable with a less arduous walk. join in the event and do the respective walk which they feel is appropriate to their own personal ‘challenge’. The walks are generally organised so that the shorter route follows the longer walk over the last few miles, and the start times of each walk are arranged so that all walkers who complete their event in an average time arrive at the finish at roughly the same time. Once over the ‘finishing line’ all walkers are then generally eager to enjoy a drink together at the end of the day in the local pub. These directions are for travelling to Baslow Car park which is the meeting point for all our walkers on our challenge walks. 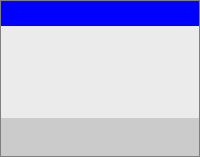 The SatNav Guidance postcode is DE45 1SR. 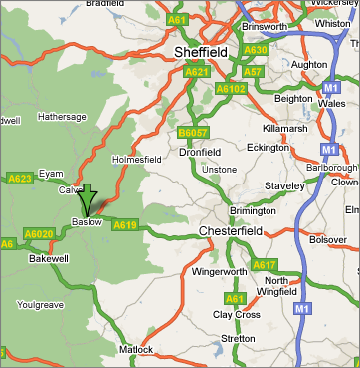 From the M1 take Junction 29 signposted A617 to Chesterfield. You will also see the brown tourist signs for Chatsworth House. Follow the A617 dual carriageway for 6 miles to the large roundabout at Chesterfield. Look out to your right for the crooked spire. Keep in the left hand lane and go round the roundabout taking the junction up towards the spire. It might be slightly hidden behind trees during summertime. Once you have taken the turning towards the spire, get in the left hand lane and bear left along the dual carriageway with a retail park on the left. Go through the lights and to the next roundabout. At this roundabout go almost straight across and take the A619 which is signposted for Bakewell and Buxton. This is now the road to Baslow. Continue along the A619 (see if you can count the pubs in the next mile or so) for a couple of miles until you leave the houses behind and the road climbs up onto the moors, before dropping down again into Baslow. 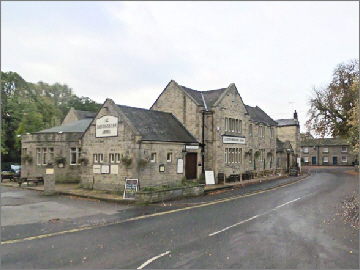 The Devonshire Arms is a family run hotel and inn, very close to Chatsworth park in the village of Baslow. 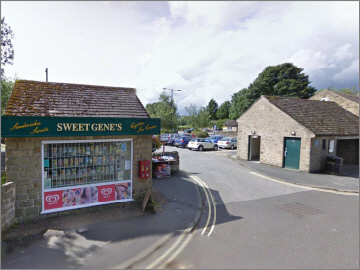 Situated next to the Village Green, and only a few yards from our starting point in the Village car park. (follow the short road in the photo to the end, and turn right, and the car park is 50 metres on your left). The Devonshire is often our finishing point for the walk ( and provides a perfect last stop at the end of the day for all our walkers. 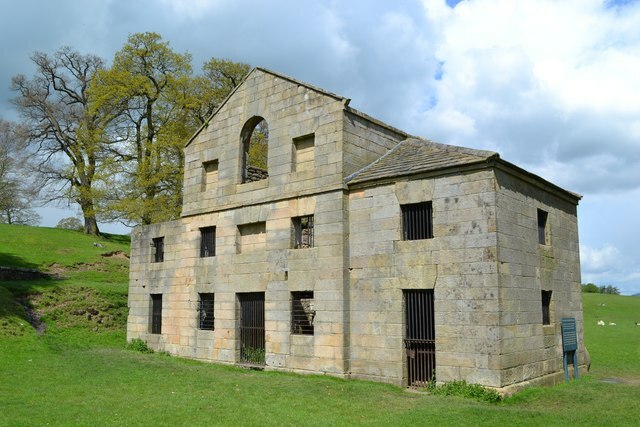 This Old Corn Mill on Chatsworth Estate was built in 1760 and last ground corn in 1950. It was badly damaged when a tree fell on it during a storm in 1962. It is now largely derelict, but parts of the wheel and grindstone can still be seen. 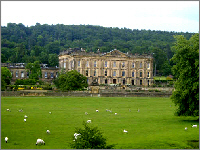 Our Chatsworth Challenge walk is a sponsored walk to raise funds for cancer charities. A shot of our now traditional mid way checkpoint, the Devonshire Arms, at Beeley without the usual clutter of strewn walker’s bags and boots. 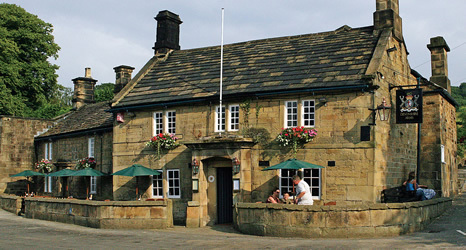 Our two challenge walks have staggered start times so that the 22 mile walkers and the 9 mile walkers are scheduled to meet at roughly the same time at the Beeley Arms, and it has always proven to be a popular stop for our walkers.